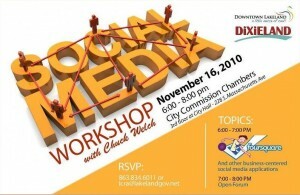 Downtown at City Hall on the 16th of November from 6-8pm, I’m leading a Foursquare free-for-all. Sponsored by the kind folks at Dixieland and the Downtown Lakeland Partnership. We’ll spend an hour on Foursquare and other business related social media. Then bring your questions and concerns for the hour open Q&A. Tamara Sakagawa claims I made the follow points during a workshop on social media. I’ll take her word for it as I don’t remember the workshop at all. I think I was channeling someone else. Anyway, the workshop was for Dixieland Community Redevelopment Area and USFPoly was nice enough to loan a lab. Not that I was there, mind you.